We are open every day over the Easter Bank Holiday Weekend. Mahorall is a small family farm situated in the beautiful rolling hills of South Shropshire. 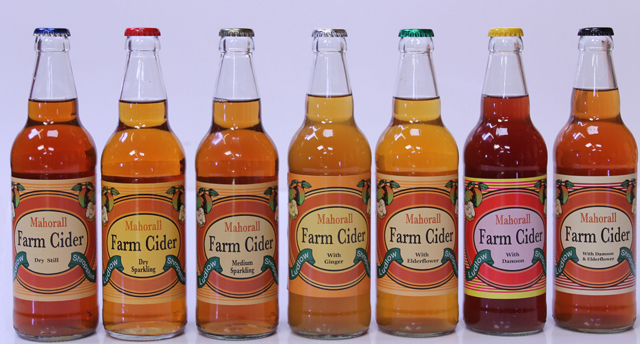 We are the only traditional family run cider farm which you can come and visit in Shropshire. Located seven miles east of the picturesque town of Ludlow, the farm has been owned and run by the King-Turner family for over 45 years. We have been making cider on the farm for 19 years. We have been able to trace the farm back to 1650 and of course many different types of farming enterprises have happened as time has gone by. In the year 2000 the King-Turner family moved from traditional mixed farming to making a small amount of traditional cider for sale. Using only 100% fresh apple juice and wild natural yeast to achieve a taste as cider should be. Visitors are welcome to come to the farm and see us to visit our small shop and walk around our free nature trail. We also are able to provide an affordable venue for parties. We hope you enjoy this website and look forward to seeing you at the farm or at one of our shows!